The deep creviced wrinkles adorning the face of the aging people around me. Every moment—moments of joy, pain, sorrow, burden, torture and love—carved deeply on their faces telling their own unique stories. The smell of coffee brewing in the early morning as my family (including the dogs) slumbers snuggled in their beds. The feel of my puppy’s silken ears and the sweet smell of her breath as she licks my cheek. The scent of a baby wrapped in a towel fresh from a bath, earthly and godly all at once. The radiant sweetness on the faces of my children as they sleep—no worries about homework and grades, no grumpy pouts from exhaustion—just peace, glorious peace. Old pictures of family, especially black-and-white photos of generations past. An ancestor who ran a bike shop in the 1800s, my mother as a child posing with “Happy Chandler” the Kentucky governor in the 1940s, my grandfather racing cars with Henry Ford, my grandparents’ wedding photos from the 1920s. All are simultaneously awe-inspiring and mundane. New spring buds waiting to burst. The crow’s feet around my husband’s eyes when he smiles simultaneously showing and hiding his sense of humor. Is he planning something devious or just enjoying a joke he just read? Watching my daughter’s intensity at home plate—dusted in orange clay with bat in hand slightly bouncing over her shoulder and eyes silently challenging the pitcher to give her a good one. A little girl in her First Communion dress. The first bite of a Thin Mint fresh from its emerald Girl Scout box. The excitement in my son’s voice as he describes his latest creation on Mindcraft. The subtle hints of fall—God sweeping his heavenly arm across the atmosphere clearing away humidity and mosquitos and blowing in crisp cool air, providing respite to the heat-weary Southerners. The carnage of wrapping paper spread throughout the house on Christmas morn. The sounds of laughter, splashing, and calls for “Marco” and “Polo” in the dead heat of summer. Women from all walks of life and neighborhoods gathering as one to steadfastly and gently offer prayers and meals and cleaning and love to a friend who is only days away from meeting the Lord. I have got to get the crack out of my house. It is just sitting around tempting me, making me all jittery in wanting it. I can almost feel the sensation of ingesting it into my system and letting the wave of pleasure wash over me. I WANT to ignore it. I NEED to ignore it, but it is everywhere—in my pantry, in my fridge, on the countertops. I even found a small bag of it under my child’s bed. That’s it!. Oh sorry, I guess I should clarify what I mean by crack. By crack I mean sugar. Why? Because sugar IS my crack. I am completely addicted to it, and as much as I want to be strong and resist its pull, I can’t because I just have no power over it. I want to detox. I mean it. But, even an hour without just a smidge of the white stuff makes me hanker for it in my BONES. You heard me, I said in my BONES. Part of the problem is that some of my very favorite forms of crack are in plentiful supply at this time of the year. The crack dealers are all out in the open in full-force-promotion mode. Some are disguised as grocery store managers and CVS clerks. Others are Dollar Store stock boys and gas station attendants. That’s right. Pushers hiding in plain sight. Don’t believe me? Look at those luscious displays of goodies surrounded by smiling jack-o-lanterns and friendly ghosts. The dealers just make it all look so appealing, and I fall for their underhanded tricks every time. Just last week, I consumed—by myself now—four bags of Tootsie Pops that I bought for “Halloween.” I thought I was doing okay because I avoided the chocolate crack. You know, the Heresy Bars, Reese’s Peanut Butter Cups, Rollo’s, and Crunch bars. Even though I am totally capable of justifying eating a Reese’s Peanut Butter Cup because it has peanuts in it, and peanuts come from the ground, and peanuts are a whole food. Therefore, having anything with peanut butter must be like eating a vegan lifestyle. Yeah, I know, that is the sick way my mind works. I could easily make the same justification for eating an Almond Joy bar if I liked that sort of thing. 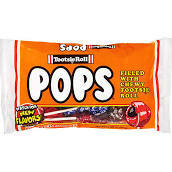 With Tootsie Pops, I can’t find any reasonable argument for consuming 4 bags of them in one week. I am pretty sure other than sugar—bleached refined white crack-like sugar—there is nothing in them that comes from the ground. But, will the logical side of my brain tell the impulsive side of me to run away? No. I am too far gone. I am like that owl in the 1980s Tootsie Pop commercials. How many licks does it take to get to the center of a Tootsie Pop? Uh one. Uh two. Uh three. Am I proud of this? No. In fact, I am not proud of any of my Tootsie crack behavior. I found myself hiding them from my kids, putting them in my purse or stashing them in my underwear drawer. The other day, I looked up and panicked because the kids would be home in 5 minutes, so I had to scramble to hide “the goods”. Whew! I was barely able to cover my crack with some dirty socks before the kids came barging into my room. Why all this? Because I did not want to share my stockpile. I KNOW this is pathetic, but…What if I ran out of Tootsie Pops before I could get to the store? Would I go through withdrawals? I talked myself into thinking it was just plain bad for my health to share candy with my children. (Now that I see this confession in writing, I think I may have to see a therapist.) My husband came home one day and found a trail of colorful wrappers that led right to my desk where I work on my writing. I must have been a sight—white lollipop stick poking out of my mouth, slurping syrupy drool from the side of my mouth, a mound of wrappers and white sticks by my side looking like the kindling for a small fire, and small pieces of hard candy sticking to my t-shirt (the ones on which I crunched too enthusiastically and debris landed on my shirt). My long and sorted history with food began at a very young age. It took me years to understand my addiction and how I used food to manage my emotions. By no means am I “cured.” Someone like me is never cured, just like an alcoholic is not cured of her addiction to beer and wine. I continue to learn about the complex relationship between food, chemicals, brain matter, and emotions. Part of this awareness has been looking back at what I ate as a child because that set the stage for the type of eater I became. I was born in the 1960s and was a child in the 70’s and 80’s. This was just bad luck for me. Historically, this timeframe is NOT the height of a healthy food industry. On the contrary, I think we could call this the “Age of Processed Food”. It’s when chemistry, manufacturing, and advertising came together to drop the P-Bomb (P for Processed) on the American diet. This movement has had lasting power because we have an abundance of processed foods today. Just look in the deli and snack aisles. In fact, about 70 percent of our calories in the U.S. comes from processed foods (PBS, 2013). We are eating double the amount of fat, 3 ½ times more sodium, and 60 percent more sugar than we did a century ago. This move to high-fat, salty and sugary processed foods happened gradually, starting with canning and pasteurization. Food scientists then included additives and preservatives, concentrated juices, and created frozen fully prepared meals. Processing foods revved up in the 1950s. No more wartime rationing, and convenience was the name of the game. 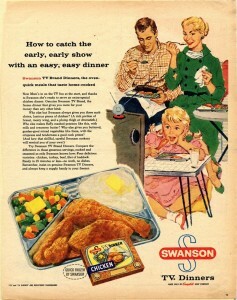 The 1950s saw a boom in frozen foods and TV dinners, and the 1960’s established the birth of artificial sweeteners, plastic bottles, and boil-in-the-bag products (Toops, 2010). It was also the decade when the microwave oven saw its way into mainstream homes, and Carnation spreadable sandwich meat products went to the moon on Apollo 11. The 1970s was the era where “lite” products were introduced, and consumer-spending habits were tracked quite easily using the laser scanners in the grocery stores. By the 1980s people were packing on the pounds, and Nestle introduced Lean Cuisine, and Healthy Choice frozen meals followed.